On Wednesday, Oct. 19th I will be wearing purple and joining Suze of Miss Vinyl Ahoy in spreading the word that abuse is not love. As you know October is breast cancer awareness month, and it is also domestic voilence awareness month. I welcome you all to also support the cause! I'm sure if you have not been affected by domestic abuse you definitely know someone who has! 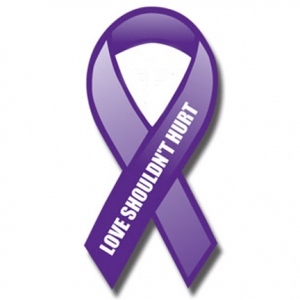 1 in 3 families are affected by domestic violence. Domestic violence is a pattern of abusive behaviors — physical, sexual, psychological, and economic coercion — used by one intimate partner against another (adult or adolescent) to gain, maintain, or regain power and control in the relationship. Batterers use of a range of tactics to frighten, terrorize, manipulate, hurt, humiliate, blame, often injure, and sometimes kill a current or former intimate partner. If you are in danger, please call 911, your local hotline, or (in the U.S.) the National Domestic Violence Hotline: (800) 799-7233 or TTY (800) 787-3224.